At Minnesota banks, bad loans are piling up much faster than the amount of money being set aside to cover them. 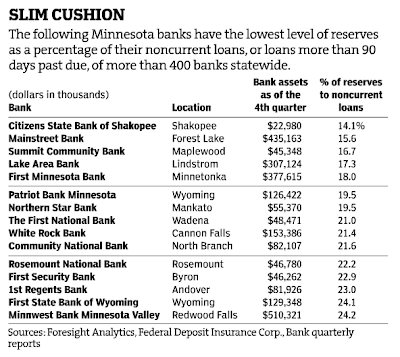 The StarTribune takes a look at the problem in State's banks below norm in reserves. Despite repeated warnings of economic trouble ahead, banks in Minnesota have failed to keep pace with the rise in bad loans. Among those banks, the ratio of past-due and nonaccrual loans -- or loans for which payment is in doubt -- as a percentage of total loans rose 50 percent since 2006, while the reserves to total loans ratio remained virtually unchanged. Many Wall Street analysts watch bank reserves more closely than bank profits, said analyst Crabtree in Minneapolis. "Earnings mean very little nowadays, because no one believes them," he said. "Reserve levels and capital ratios are by far more important." As of the third quarter, the average coverage ratio for Minnesota banks fell to its lowest level in nearly two decades. As of Sept. 30, the coverage ratio for Minnesota banks was 61 percent, which means that for every $1 in noncurrent loans the banks have set aside 61 cents to cover future losses, according to the FDIC. That's down from 81 percent a year earlier. Nationwide, the coverage ratio stands at 85 percent -- nearly a third higher than Minnesota's. Nearly 40 of the state's 400 banks have coverage ratios below 30 percent, a level that is less than half the state average. Among the larger ones are First Minnesota Bank of Minnetonka, with more than $370 million in assets, and Minnwest Bank Minnesota Valley in Redwood Falls with assets of $510 million. One reason Minnesota banks are reserving less than peers in other parts of the country is that the state experienced a boom in bank startups earlier this decade. So, like Summit, many of these banks are still building reserves. Another theory is that Minnesota has a larger number of small, community banks than other states. Those banks made fewer of the subprime mortgages that defaulted in the credit crisis, but did more of the commercial real estate loans that have only just started to turn sour, said several bank experts. The Article is 4 pages long with two interesting graphics worth a good look. Here is one of the graphs. Nearly 40 Minnesota banks have coverage ratios below 30 percent. They are at severe risk. Mainstreet Bank, one of Minnesota's largest and oldest community banks received an FDIC order to change. Please see Hazardous Lending and Lax Collection Practices for more details. On Friday, Three More U.S. Banks Were Shut by Regulators. Three banks, two in California and one in Georgia, were seized by regulators, bringing this year’s tally of closings to nine as a recession and record foreclosures extend the biggest financial crisis in more than 70 years. County Bank of Merced, California, with deposits of $1.3 billion and assets of $1.7 billion, was shut yesterday by the state’s Department of Financial Institutions, according to an e-mailed statement from the Federal Deposit Insurance Corp. Westamerica Bancorporation, holding company for Westamerica Bank, acquired all the assets and deposits. The Georgia Department of Banking and Finance closed McDonough-based FirstBank Financial Services Inc., which had $337 million in assets and $279 million in deposits as of Dec. 31, the FDIC said in a statement. The California Department of Financial Institutions shut Culver City-based Alliance Bank, with assets of $1.14 billion and $951 million in deposits. Nine bank closings this year is a drop in the bucket for what is coming. And were it not for taxpayer bailouts of Citigroup (C) and Bank of America (BAC) they would already be under as well. For further discussion see Extreme Leverage In Reverse Portends Global Systemic Crash. In aggregate, the entire global banking system is insolvent.